You lose some… you win some! I will start off with an apology for not updating the website sooner. Me and the whole family have been extremely busy and still are, especially this week leading up to the world final. Just when I thought my luck couldn’t get any worse I go and win the final at Birmingham! Brother Danny was quicker but got tangled up and I nipped through. Guess I was in the right place at the right time! Now that’s the kind of luck I’m due – of that I’m sure! Most of you will be aware that I suffered engine problems at Coventry earlier in the season. Well, something amazing happened. A wonderful chap called Pete Ayriss decided to start a fundraising account. The idea was that people who wanted to, could donate towards my engine re-build. Fans and even non-fans chipped in and a very generous £2600 (approx) was raised. Basically it’s like this. 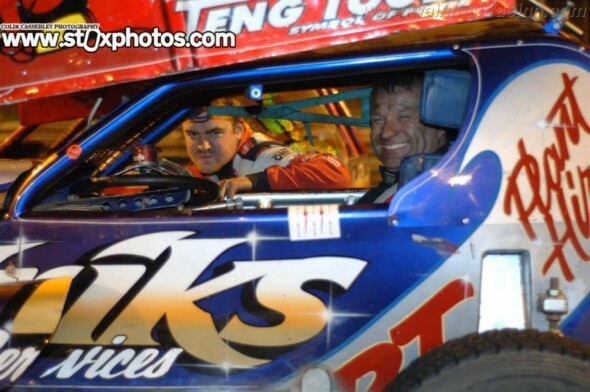 If this had not have happened I would not be racing my shale engine at King’s Lynn this coming weekend. I cannot express my thanks enough to everyone, and have been feeling a little speechless about it all to be honest. It’s truly brilliant, so a massive massive thanks to everyone! Danny has had a mixture of highs and lows this season. I will tell you this though, when he’s on it, he’s as quick as! He’s doing brilliant in the BOSS track championship, leading it with a comfortable margin. Fingers crossed that the BOSS shield will be coming to Silsden. Like me, Phoebe and Frankie JJ have suffered with engine troubles. At Birmingham Phoebe only managed 1 race before pulling off. At the time we thought she had done a head gasket, but a fortnight later at Skegness we discovered it was in fact a piston. A bit disappointing, but there’s nothing you can do about it. We are currently waiting for a new set of pistons to arrive. Hopefully she can make it out at Stoke. Young Frankie has been picking up decent places here and there, but he’s not as dominant as he has been. Some massive hits have taken their toll, plus engine problems, as recently as Birmingham just gone, he did a rocker. That’s not what you need the week before his gold top race, but we just have to keep trying and working hard to get out on track. So this time next week there will be a two new world champs! F1s and ministox. Will either of them be from Silsden? I hope so. Thanks again to all who supported me, over the years and more recently. Finally, we’re pleased to announce that a new range of Wainman Racing merchandise will be on sale this weekend.